The main, titular song on a single. The secondary song/s featured on a single, following an A-Side. Literally, “pretty boy” in Japanese. Refers to an effeminate/androgynous type of male. A chord-progression is a series of chords that, when played in sequences, form melodic lines in music. Commercial Message. Usually presented as a short video in which the band presents a message to fans concerning recent releases, tours, etc. Noun and verb in one, Cosplay (contracted from “costume-play”) is the act of dressing up in the costume of a favorite personality (usually an anime or video-game character, but it has more recently become popular to cosplay figures such as Visual Kei band members and so on) and assuming their characteristic traits while in said costume. Originates in Japan. Asian version of the sitcom. Some of the first “Jpop”, Enka is a style of early pop music sung in a traditional style. Some enka (especially that which originates in Okinawa and southern Japan) includes use of traditional instruments including shamisen, taiko, shakuhachi or shinobue (Japanese bamboo flutes). Enka became popular in the 1930’s and ’40s, typically dealing with deeply nostalgic, romantic themes such as you, me, and the moonlight that were meant to inspire sentimental memories of the good old days before the Americans came in. Popular at karaoke. An “EP” is an “Extended Play”, or an album which is longer than a single, but shorter than an album. They usually have around 5 or 6 songs, and typically do not include instrumental, remixed, or karaoke versions of songs. The band backing GACKT’s solo project. Consistent members: Chachamaru ( band-leader, arrangements, production, lead guitars), YOU (rhythm guitar and violin). Support members: Chirolyn (bass), Minami (drums). Recording members: IKUO (bass), SHUN (guitar), Tsukasa (drums). Former members: Masa, Ren, Ryu (percussion) JU-KEN (bass), Nell (bass). Japanese rock music at large. This is an extremely general term that encompasses the entire scope of Japanese rock music. Usually includes Visual Kei as a sub-genre, but excludes Jpop. To learn about how Jrock differs from western rock, keep reading SG. Soushokukeidanshi poster-boy, Johnny’s idol (KAT-TUN), and gp’s favorite scapegoat. Iconic of everything confused and confusing in Japan. Chinese characters used to write Japanese. Suffix. Means “type” or “style” and can be combined with many different words to articulate a trend or style. For example, Visual-kei (Visual-type), Oshare-kei (fashion/stylish-type), and so on. Korean pop. Contrary to popular belief, it is not encroaching on the Visual Kei market… Only on my Twitter newsfeed. A “Lawson” is a chain of convenience stores found across Japan, which house the veritable machine of the future: the Loppi. Among other functions, college-tuition can be paid at the Loppi, fan-clubs can be joined, and concert tickets can be purchased– all on the little angelic screen. Lawson also runs an online version of the machine, which is terrifying for the average Japanese language student to behold. A live show where only the title band performs. OPening. Refers to the opening theme song played at the beginning of each episode of animes, dramas, and television shows. OriCon, which is contracted from Original Confidence, is a Japanese system of media rating. Japanese artists will appear on the OriCon daily, weekly, and monthly charts, earning their spot based on quality and sales. To make it to the OriCon Top 10 is a great honor– although somehow it seems easier in the past five years or so. “Permanent wave” hairstyle. I struggle with an intense love-hate relationship with them, and a neurotic inability to stop discussing them. Promotional Video. The Japanese music-industry version of the Western “MV”, or music-video. A phrase I invented to describe the fusion of Visual Kei or Jrock and traditional Japanese aesthetics, both in style and music. The words are a combination of “samurai” and the pronunciation of “punk” in Japanese. Ritual suicide wherein the unfortunate person disembowels themselves with a Japanese short-sword (wakizashi). It’s what I’ll do if Arashi ever really does make a formal appearance on SG. Translates literally as “plant-eating guys, meat-eating girls,” and is a current trend in Japan encouraging men to emphasize their feminine side. Somewhat controversial. The word I substitute for ‘fan’. What defines a “Visualist”? Anyone involved in the Visual Kei lifestyle on a level deeper than just “it’s on my iPod” can be safely considered a Visualist. The second round of Visual Kei bands that were founded in the early-mid ’90s, after the 1st generation had started breaking up, moving on, or veering away from what would, in the ’90s, become a popular mainstream genre. Refers to the Visual Kei groups/music/style founded in the past five or ten years. Including most of the PSC boys and heavily themed indie bands like D.
When aliens invade the earth everything goes wrong. Can you recommend good “starter” bands for regular people? Most angura-kei bands are a pretty safe bet, as they look more like regular rock-stars. Start out with/start your normie friends out with girugamesh, Vidoll, GACKT, 9 Goats Black Out, The GazettE, X-Japan, and Alice Nine. From there, move on to MIYAVI, Malice Mizer, D, etc. Obviously cater to the particular tastes of each individual. Goths might be more comfortable with men in corsets and garters than most Linkin Park fans. The short answer is, “no”. The long answer is, the general misconception is that ‘they are all men dressed as women’. Any Visualist with some self-worth will redirect you politely to the fact that they are men using the (aforementioned) principles of ‘youshikibi’ as a means of expressing their creativity. Their concern is not whether the outfit is pants or a dress, male or female-designated, their concern is whether it is aesthetically pleasing [to them] or not. If it is aesthetically pleasing, then it does not matter to which denomination it belongs, who is “supposed” to wear it, or what gender it was “intended” for. Visual Kei is an unbiased appreciation of beauty. What’s Johnny’s Entertainment, and why do you always bash it? Johnny’s Entertainment is a talent agency in Japan that scouts multitudes of average young males at very young ages, and sculpts them into idols. They glump them into idol groups consisting of ten-million members, give the groups easy-to-remember names like “NEWs” and “KAT-TUN” and have them all sing harmonies so they can disguise b-average singing talents. I don’t bash them for any particular reason. How do I buy concert tickets for concerts in Japan? I’ve never done it before, but based on my research: Unless the artists’ management makes tickets available on English websites to overseas fans, you’ll need to have a friend, shopping service, homestay family, or otherwise Nihon-based connection buy tickets for you from a ticketing agency, Lawson, etc. What’s the difference between a “fan” and a “Visualist”? In my eyes, for whatever reason, I feel like the term “fan” has a slight negative connotation. I always imagine those squawking teenybopper girls who are all up in your grill like, “awwwwmawwwwwgawwwd thurrrrr sooo hawwwwtttt”. I can’t even deal with that. I think of myself, and many others, as “visualists”, because of the extent to which we have incorporated Visual Kei and Jrock into our every day lives. It’s not a music preference, it’s a lifestyle choice. For me, that’s the difference. For you, well, I invite you to decide. Who translates the material on Secret Garden? 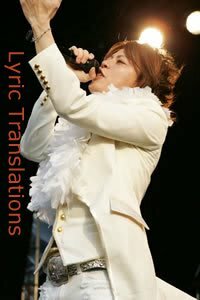 All lyrics, news, profile data, and tour schedules/information that appear translated on SG have been translated by me. From time to time I will post translations that have been translated by others; in this case I credit and, if possible, link back to the original translation. I’m trying to figure that one out as well. Have questions you want answered? Questions, requests, and suggestions can be directed to gacktpause, at gacktpause [at] gmail [dot] com.